Rescue at sea, asylum and immigrants fundamental rights. What is the European Union’s Approach? Accused of not helping migrants in distress the European Union however enjoys no competence in this area. The inclusion of an objective like this in the FRONTEX and EUROSUR missions might encourage traffickers to put migrants knowingly in danger and it is especially important to prevent the latter from embarking on unsafe vessels. With this idea in hand the European Council of October 2013 suggested stepping up and externalising the fight to counter illegal immigration. This might help in solving the Member States' problem of sharing the burden in their reception of migrants and counter the temptation to reintroduce internal borders within the Schengen Area. But in order to prevent migrants dying further from the borders of Europe the European Union, in line with its values, has to support third countries more and show the example by its generosity. After the disasters off Lampedusa and Malta the European Union was accused of not helping migrants in distress in the Mediterranean. What instruments does it have at its disposal to address these situations and what kind of approach is emerging after the European Council in October 2013? 1. The fight to counter illegal immigration at the service of rescue at sea? With its Charter of Fundamental Rights the European Union aims to promote migrants' rights.. However Member States did not include in the charter any competence regarding rescue at sea which at present is the preserve of two international conventions: the international convention for the preservation of human life at sea, the so-called "SOLAS" convention and the search and rescue convention, the so-called "SAR" convention which entered into force in 1980 and 1985 respectively. However these two conventions frequently lead to disputes in terms of their interpretation notably between Italy and Malta as these countries mutually try to make the other responsible for the rescue of sinking boats at sea. The issue of attributing competences to the European Union in terms of rescue at sea was discussed in October 2011 when the regulations of the agency FRONTEX were reformed (the latter aids Member States in the monitoring the EU's common external borders). The same applied when the regulation on the European Border Surveillance System was adopted on 9th October last (EUROSUR), which via the interconnection of national surveillance systems will enable improved detection of illegal cross-border movements as of December 2013. A FRONTEX cooperation programme, Seahorse Network, with third countries will be extended to Libya, then to Morocco and Egypt. In both instances Member States highlighted the idea that the main goal of these two operational mechanisms is first and foremost to counter illegal immigration and that the inclusion of a goal for rescue at sea might have been interpreted by unscrupulous traffickers as an invitation to place migrants knowingly in a critical situation so that FRONTEX and the Member States would be obliged to fly to their aid. Hence the efficacy of the fight to counter illegal immigration, which by preventing migrants from crossing the Schengen Area's external borders and if possible from embarking on dangerous boats, should as a result (not as a goal) protect them from peril at sea. But if illegal migrants are prevented to entering Member States' territories how can they request asylum? Article 1 §A2 of the Geneva Convention stipulates that a refugee is a "person who owing to a well-founded fear of being persecuted for reasons of race, religion, nationality, membership of a particular social group or political opinion, is outside the country of his nationality and is unable or, owing to such fear, is unwilling to avail himself of the protection of that country; or who, not having a nationality and being outside the country of his former habitual residence as a result of such events, is unable or, owing to such fear, is unwilling to return to it (...)"
Moreover the principle of no-refoulement article 33 §1 of the Geneva Convention prevents a contracting State from expulsing or returning anyone "to the borders of territories where his life or freedom might be threatened (...)". Hence in principle people have to have reached a Member State's territory to be able to ask for asylum. An HCR consultative opinion in January 2007 stipulates that the no-refoulement principle applies "everywhere where the State exercises its authority including (...) on the high sea (...)." Moreover in virtue of article 92 of the Montego Bay Convention of 1982 on the law of the sea "ships sailing under the flag of one State only are subject, except in exceptional circumstances included in the international treaties or in the Convention, to the exclusive jurisdiction (of that State) on the high sea." However with article 29 of the Vienna Convention on the treaties' law of 1969 in hand, which stipulates the territoriality of the application of the international conventions, the USA for example does not feel concerned by the no-refoulement principle if its coastguards intercept asylum seekers on the high seas. Indeed in the Mediterranean when migrants are intercepted in the territorial waters of third countries, bilateral agreements govern their access to asylum procedures. Hence Spain has signed agreements with Senegal, Morocco and Mauritania which plan for the immediate return of intercepted migrants without them having any possibility of applying for asylum with Spain. As far as migrants intercepted on the high sea are concerned, cases of refoulement without access to European asylum procedures have occurred. In May 2009 Italian coastguards sent Somalis and Eritreans back to Libya in line with the bilateral agreement signed a few months earlier with this country. Since two people died in Libya and several were acknowledged as refugees by the HCR office in Tripoli, Italy was condemned by the European Court of Human Rights (ECHR) in the case Hirsi Jamaa and others vs. Italy in February 2012 for not respecting the no-refoulement principle. Learning from this case the Commission launched a draft regulation in April 2013 notably aiming to clarify access rules to asylum and possible disembarkation procedures in third countries as part of FRONTEX's maritime operations now being negotiated. 2. What are the prospects for the protection of migrants' fundamental rights? Pointing to the "imperative to prevent and protect" and the "principle of solidarity and the fair distribution of responsibilities" the European Council is maintaining the idea of protecting migrants via improved border control and is stepping up the externalisation of the European migratory policy. Prevention and protection against illegal immigration? For improved control of migratory flows the European Council is suggesting first and foremost greater efforts in fighting human trafficking and that of migrants and to make the return policy more effective. To this end the European Union might try to strengthen European texts by implementing sanctions against carriers (directive of June 2001 and March 2004), entry assistance, transit and illegal residence (directive of November 2002), against human traffickers (framework decision of July 2002) , and against employers of illegal immigrants (directive of June 2009). However, sanctions, which are necessary to lend credibility to the fight against networks, might dissuade some carriers from launching rescue operations. Moreover we have to be aware that since visas for Member States are difficult to obtain, if there are no smugglers, most people who require international protection might not be able to get to Europe and that the acceleration of the fight to counter human trafficking and that of migrants might also restrict access by these people to European asylum procedures. The Union will also try to increase the number of readmission agreements whereby third countries commit to readmitting their own nationals or citizens from third countries or stateless people who have transited through their territory. Since 1999, the European Union has negotiated 18 agreements with countries like Russia, Ukraine, Pakistan, Sri Lanka, the Balkan countries, Cap Verde. 13 agreements are effectively now in force. To help third countries fight illegal immigration the European Union could support the development of their border control systems. However the European Union seems to be more in demand of these agreements than third countries which benefit from the transfer of migrant remittances and which have to bear the financial burden associated to readmissions .Without any counterbalances such as visa facilitation or an increase in development aid some agreements likes the ones with Morocco and Turkey struggle to become a reality. Above all asylum systems in third countries do not always offer asylum seekers the same guarantees in terms of the respect of their fundamental rights as those in the Member States. For example Ukraine, which with the EU signed a readmission agreement in 2007, tried to dispatch people deemed to be refugees by the HCR to Russia. Moreover some readmission agreements were signed with countries - Sri Lanka in 2005 and Pakistan in 2010, where it is known that there is persecution due to religious or political beliefs or because of specific ethnic membership. Finally even though it has been criticised, the "return" directive dated December 2008, defines joint standards and procedures for the return of third country citizens who are in an illegal situation which protects their fundamental rights. Member States must notably take on board the higher interest of children, family life and a person's state of health. They also have to respect the no-refoulement principle (art 5). But according to article 2 the directive applies to third country citizens in illegal residence "in the territory of a Member State." It might then be interpreted in a way for it not apply to people arrested as they cross the Union's borders. The European Council is asking moreover for FRONTEX's activities to be stepped up in the Mediterranean and along the EU's south east borders, as well as for the rapid implementation of EUROSUR. The choice of acting as far as possible from Europe's coast in order to prevent migrant access to Member States' territories as much as possible might help settle the issue of how to share the burden of hosting of these migrants and asylum seekers in that Italy, Malta and Greece, as well as France, and Germany would take fewer of them. This would also counter the temptation to re-introduce border controls within the Schengen Area. But the recent reform of the governance of this area adopted by the Council on 8th October 2013 tries however to extend the criteria for the re-introduction of internal border controls in the event of serious and continuous failure by a Member State in terms of controlling its external borders. However will the increased externalisation of the Union's migratory policy, which places the burden of hosting migrants and asylum seekers on third countries go together with an adequate protection of migrants' fundamental rights, particularly of those who need international protection? Solidarity and fair sharing of responsibilities with third countries? To maintain a high level of protection of migrants' fundamental rights generally and of asylum seekers in particular, the European Council suggests greater cooperation with third countries in areas of development and asylum. In effect the European Council is requesting "appropriate support" from the countries of origin and transit via development aid which should make it possible to "address the in depth causes of these flows". Indeed since the European Council of 2005 the European Union has been trying to promote "an overall approach to migration" which wagers "a triple win" whereby the requirements of the European labour market would be satisfied, migrants would benefit from a more stable status and the development of the countries of origin would be supported. The organisation of legal immigration flows, notably via Mobility Partnerships might prevent migrants from trying to take illegal paths into the Union. However since the EU's goal is a better control of selective immigration and the relation of causality between development and a reduction in immigration has not been established, for the time being at least, it is not certain that this approach will be enough to "address the in depth causes of illegal flows". In addition to this Europe is involved in the support of third country asylum systems to which it is trying to convey its own values. Regional protection programmes financed by the EU aim to help third countries improve their local infrastructures and their administrative and legal capabilities in the reception of asylum seekers and the processing of their requests. Pilot projects financed by the EU and steered by the HCR were notably launched in Ukraine, Moldova, Belarus and Tanzania. In December 2011 a new regional protection programme was introduced in North Africa, including Egypt, Tunisia and as far as possible, Libya. In Syria the European Commission is setting up a regional protection programme. The HCR believes however that these agreements can complete but in no way replace access to fair asylum procedures in Europe. The low sums of money devoted to these programmes and the choice of countries benefiting from them (Belarus and Ukraine) have also been the source of criticism. The danger is that these programmes will not function properly since the target countries have neither the means nor the will to implement them in the spirit of protecting the fundamental rights which they are supposed to be disseminating. Human catastrophes might occur without European public opinion being fully aware of them, since events might happen far from their borders. Resettlement programmes which aim to offer people who are recognised as being refugees outside of Europe by the HCR the chance of settling long term in a Member State are still necessary. 97% of Syrian refugees representing 2 million people in September 2013 were to be found in the countries on Syria's borders, a situation which as a result is threatening the formers' political stability. The HCR asked the EU, which is only hosting 52,000, to offer humanitarian asylum to 10,000 Syrian refugees in 2013 and 30,000 in 2014. At the end of September 2013 Germany had committed to taking 1,500, France and Austria 500. In 2012 in the Union only 4,500 refugees had benefited from resettlement. Moreover the directive on temporary protection adopted in July 2001 aims to organise, in the event of massive inflows of displaced people, a distribution of asylum seekers amongst the Member States in order to guarantee a balance between the effort each one agrees to make. But this directive has never been implemented, whilst the flows associated with the Arab Spring and especially the Syrian crisis, since 2011 would easily have justified its use. Hence in order to be worthy of the values which it claims as its own, notably regarding asylum seekers, the EU cannot just enhance its border controls and externalise its migratory and asylum policy. 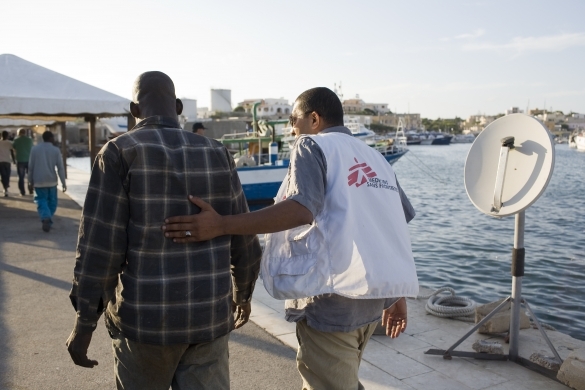 To ensure that migrants do not die, not in the Mediterranean, but further from the borders of Europe, far from European cameras, and to be credible in the promotion within third States of asylum and immigration systems that respect fundamental rights, the EU will have to set the example of generosity by implementing for example the directive on temporary protection or by enabling the resettlement of greater numbers of refugees. "Unless a different intention emerges from the treaty or is not established, a treaty links each of the parties to all of its territory." Forum Réfugiés, L'asile en France et en Europe. État des lieux 2010. Xe Rapport annuel de Forum Réfugiés, La Nouvelle imprimerie Laballery, 2010. Also: Casella Colombeau (Sara), Charles (Marie), Clochard (Olivier) and Rodier (Claire), Agence FRONTEX : quelles garanties pour les droits de l'homme ? Étude sur l'Agence européenne aux frontières extérieures en vue de la refonte de son mandat, November 2010. Before disembarking in a third countries people should indeed be identified, their personal situation should be assessed and they should have an opportunity to present objections about the place of disembarkation about which they have been informed (art. 4). Cf. European Commission, Draft proposition on the part of the European Parliament and the Council establishing rules for the surveillance of external maritime borders as part of the coordinated operational cooperation by the European Agency for the management of operational cooperation on the EU Member States' external borders COM (2013) 197 final, 12th April 2013. Directive 2001/51/CE, dated 28th June 2001, aiming to complete measures in the article 26 of the Convention for the Application of the Schengen Agreement dated 14th June 1985. Also: Directive 2004/82/CE by the Council 29th April 2004 on the obligation for carriers to communicate data about their passengers. Directive 2002/90/CE dated 28th November 2002 defining entry assistance, transit and illegal residence. Also: Framework decision by the Council 2002/946/ JAI, dated 28th November 2002 aiming to strengthen the criminal framework for the repression of entry assistance, transit and illegal residence. Directive 2009/52/CE of 18th June 2009 planning for minimal standards as far as sanctions and measures are concerned against those employing citizens from third countries in a situation of illegal residence. It is notably accused of allowing detention to be extended by 18 months - a measure which can apply to minors together with the possibility of prohibiting any further entry into the EU for up to five years, which could impede family grouping. Directive 2008/115/CE by the European Parliament and the Council dated 16th December 2008 relative to common standards and procedures applicable in the Member States to the return of third country citizens in a situation of illegal residence. 3260th, Justice and Home Affairs Council meeting, 7th and 8th October 2013, press release. Directive 2001/55/CE of the Council dated 20th July 2001 relative to minimal standards in terms of granting temporary protection in the event of massive inflows of displaced persons and measures that will guarantee a balances between the effort each Member States has consented to make to take in people and bear the consequences of this reception.